(Go to Part 1) Slingboards Lab mission is to bring your team at your fingertips. Through the provision of slingboards, it brings sticky notes to smartphones, tablets and the web for empowering teams to better collaborate. A slingboard ensures teammates are always in sync. It provides real time feedback to everyone involved in the whole process. It highlights the flow of work and what is being done. A slingboard allows instant access to the workflow. Remote and teleworkers can easily collaborate with their colleagues in teal time. Because the tablet layout have the appearance of the original yellow stickies, learning to use a slingboard is simple. 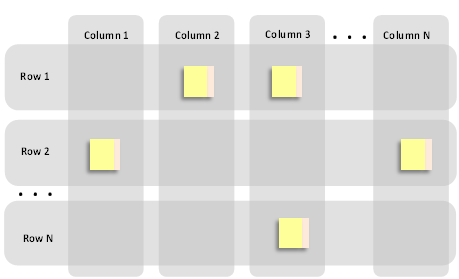 The familiar sticky notes essentially became the user interface. Team members can quickly embraced this new technology. A slingboard increases accountability and positively influence the behavior and attitude of team members . Teammates define and choose their own work instead of having work assigned to them. High visibility and clear guidelines ensure teammates cannot hide work (or non-work) from each other. They know that at any moment, if they want to, they can, with zero overhead and without causing any discomfort to anyone, see exactly what everybody is doing. Boards tend to expose the flow, but it is done with ground rules that people find quite reasonable. Thus, accountability is achieved in a harmonious way because it boils down to the individual responsibility of updating the board. This builds transparency among team members, which in turn builds trust. Categories: Lean Startup | Tags: Slingboard | Permalink. It has been over ten years that I have a personal website at “mariocardinal.com”. For several years, I have managed the content of this website using the obsolete product CityDesk created by Joel Spolsky. Until recently the site was still promoting my consulting services. It was a simple website with few pages and no more. Times are changing and there is something new. I finished a cycle with the forthcoming publication of my book “Executable Specifications with Scrum“. I gradually leaves consulting and moves on to other challenges. After several years with success as an agile coach specializing in architecture, I return to my first love, the entrepreneurship. I am the co-founder of Slingboards Lab, a young start-up that helps build collaboration boards for tablets and mobile phones. Obviously, besides Slingboards Lab, you will find posts that will address more specifically my book “Executable Specifications with Scrum“. I remain fascinated by software development with agile practices. Especially since I discovered many similarities between starting a business using “lean startup” and “iterative requirements’ discovery”. I will be back soon on this topic. Thank you to accompany me. The journey looks bright. Categories: Announcements | Tags: Executable Specifications, Slingboards Lab | Permalink.